Each month, AdMob, a mobile advertising network, rounds up the data from over 6,000 mobile websites and applications, analyzes it all, and releases their findings in their Mobile Metrics Report. In the September report, AdMob determined that the iPhone had become the #4 handset worldwide by count of ads requested. In the October release, the iPhone has skyrocketed all the way to #1. Note that these rankings are not directly representative of sales numbers; while AdMob’s ad network is wide enough that these numbers can provide an accurate picture of usage trends, they don’t necessarily prove that one handset is outselling another. Within the Top 5, the only major change is the iPhones sudden surge. Below that however, notice the BlackBerry 8100s sudden disappearance from the list – it has shifted down to #11 (not shown in image), sitting just below the BlackBerry 8300. Why might this be? Well, the 8100 is a good half year older than the 8300 – chances are, more 8100s are reaching retirement. In September, we were a bit surprised to see the iPhone sitting all the way down at #7 in the US while it managed to snag the #4 spot worldwide. In October, the iPhone’s rank seems a bit more well aligned with it’s worldwide status, coming in at #2. iPhone requests have more than doubled, allowing it to knock the KRZR down a notch. The rest of the list moves in relation, though as with the worldwide rankings, we see the BlackBerry 8300 climb as the 8100 sinks. One thing to note with all of these statistics, however, is that the AdMob advertisements embedded into iPhone applications are counted alongside web site statistics. If these same advertisements are not embedded into applications on all of the other platforms, wouldn’t the numbers be skewed in favor of the iPhone? Even if they were given the same real estate across all platforms, third-party applications are a far more significant part of the iPhone than they are for the vast majority of devices; if you own an iPhone, chances are great that you’ve installed (and regularly use) a handful of applications. Can you really say the same about the KRZR, or the Kyocera K24? Wouldn’t this, too, skew things a bit? I’d be interested in seeing how the results change when limited to data gathered from website ad units. As in September, the Danger Sidekick II is the only Sidekick device to break the Top 20, though it has slipped down from #15 to #16. 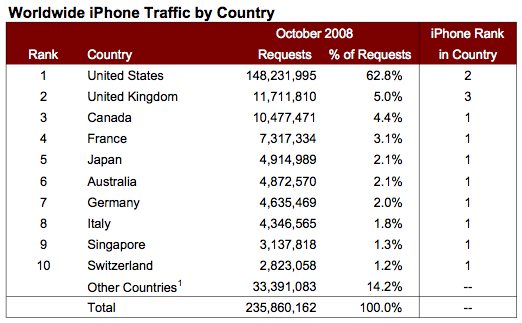 62.8% of iPhone requests were from the US. If you’ve got a couple hours to kill tearing through page upon page of statistics (now including stats for Latin America! ), you can find the full report here.